Superior Performance and Reliability in a Low Profile Design. 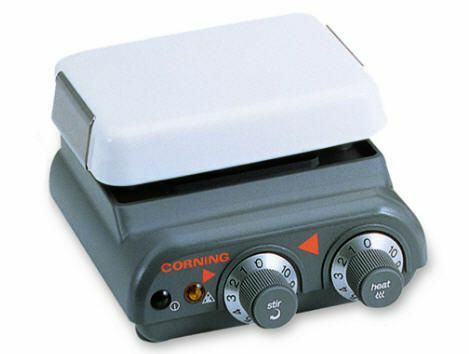 This Corning® hot plate/stirrer has a durable glass-ceramid 4x5" Pyroceram® top and offer excellent performance and reliability in a space-saving design. It offer closed-loop stirring for consistent and accurate speed and to get the job done quickly, efficiently, and safely. A hot top indicator light blinks a warning if the top is too hot to touch (>140 °F) - even when the unit is turned off. A built in holder accommodates optional 4" stainless steel support rods. 120V or 230V units are available and are UL and CUL approved to meet needs in North America and other locations around the world. A 1x3/8" stir bar is included with each stirrer. Certifications: UL and C-UL listed. CE marked. FCC, IEC1010, and GS certified. Ordering information: Supplied with manufacturer's two-year warranty on parts and labor. Includes stir bar and instructions.